The City of Richmond maintains a 49 kilometre dike network. The dikes and irrigation programs are managed by the City's Roads and Construction section in accordance with the Provincial Diking Authority requirements. Irrigations programs are coordinated in consultation with the farming industry. Dikes are built well above the highest flood of record in 1894. Richmond City Council had the foresight to create a dike utility in 2005 which is a source of dedicated funding for dike upgrades. The City monitors the river water levels electronically on a 24/7 basis. The City has the ability to dispatch public works operations staff to respond to any emergency on a 24/7 basis. The City has proactive engineering operations and maintenance programs. The City has a vast flood prevention system which includes approximately 600 km of drainage mains, 39 pump stations, 320 km of ditches/canals/sloughs. The City has numerous mobile generators to power pump stations in the event of a power outage. The City completed regular dike upgrade capital programs. The City has developed a long term flood management strategic plan. The City is in the process of updating our flood plain management bylaw. Residents who are concerned about possible flood risks should consult the Emergency Preparedness section of this site. Also see Flooding for information about what to do if a flooding emergency occurs. Note: The spelling of the word "dyke" or "dike" varies depending on the source. Both spellings are correct. In Richmond many of our legal and historic documents and also some signage pertaining to dykes use the spelling with a ‘y’, however; in recent years and moving forward, the City will use the spelling ‘dike’. Richmond’s unique characteristics make it a great community to live, work and play. The fact that Richmond’s geodetic location is approximately one metre above mean (average) sea level and on a floodplain, however, often raises questions about the potential for flooding. Although not officially designated as such, Richmond is located on a floodplain. A ‘floodplain’ is: “land adjacent to a watercourse that is susceptible to flooding”, such as from periods of high tide. In addition, isolated instances of flooding can occur in any community as a result of unanticipated weather events. To protect Richmond from the possibility of flooding due to high tides or river floods, the City has constructed a comprehensive system of dikes on Lulu Island. These dikes are over 49 km in length and protect an area of 12,805 ha. Mitchell Island is protected by dikes which are privately owned and maintained. Sea Island dikes have been maintained and improved primarily by the Vancouver International Airport Authority. The City has an extensive system to remove drainage water caused by adverse weather conditions. This system comprises 320 km of ditches and canals and 600 km of box culverts and storm sewers. River water level events Spring Freshet: higher than normal snow packs within the Fraser River Basin, combined with consistent, warmer than normal Spring weather patterns, can cause a rise in river discharge. Weather events Heavy rainfall: sudden, heavy rainfall events could exceed the processing capacity of drainage systems. Combination of events A weather or river event occurring at high tide: if a section of the dike were to breach at high tide, water could flow into areas that are lower than the height of the tide until such time as the tide recedes. This could cause localized, temporary flooding. So, what are the chances that any of these risks will materialize? Let’s take a look at Richmond’s History of Flooding. Freshet – The highest freshets occurred in 1894, 1948, and 1972. In each of these instances, no flooding occurred on Lulu or Sea Islands. In 1948, there was minimal flooding on Mitchell Island (where dikes had not yet been constructed). It is also important to note that Richmond is located far to the south of the peak snow pack runoff points. This means that the water level is considerably lower in Richmond due to the widening of the river. This gives the water a larger distribution area, thus reducing its vertical influence on the river. The water then releases to the Gulf of Georgia. Weather Events – Richmond’s drainage system is designed to accommodate a 1:10 year storm event. There have been some minor instances of property damage to low-lying properties caused by flooding during heavy rainstorms that exceeded a 1 in 10 year storm event. Dike Breach – There is no record of a breach which has resulted in flooding since the major diking network was constructed by the first settlers of our community. The dikes were further upgraded in the 70’s and 80’s to accommodate a 1 in 200 year event. Richmond’s dikes are constructed to a level which is two feet above the highest ever-recorded water level at this location on the Fraser Basin, which occurred in 1894. This meets the Provincial standard, which provides protection for a 1 in 200 year flood event. A weekly inspection and maintenance program to ensure the dikes remain stable at all times. A vegetation control program, to remove any brush and tree growth that could compromise the integrity of the dikes. An annual dike survey program, based on a 5-year cycle, to monitor settlement and carry out required upgrades to ensure the dike elevations are maintained at or above the 1:200 year standard. 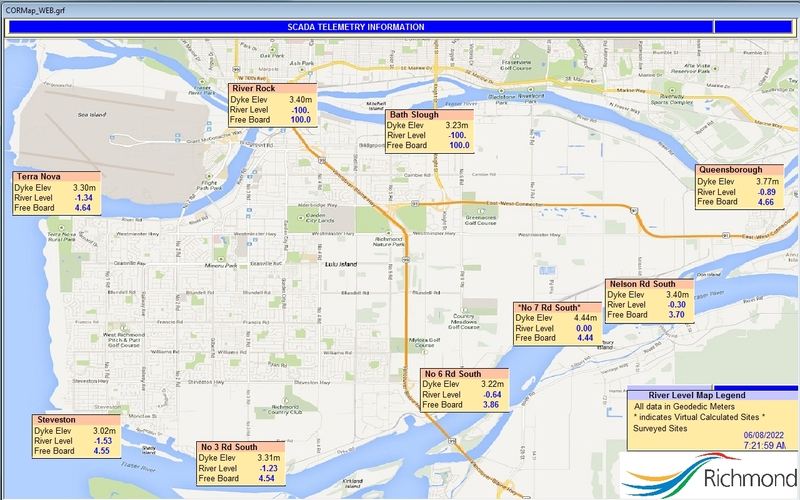 24-hour electronic river level monitoring systems at four key locations. A Floodplain Management Policy, which establishes minimum flood construction levels and outlines future initiatives to enhance flood protection. A dike seismic study to determine the potential impacts of an earthquake on key areas of Richmond’s dike network. Where required, the dikes will be strengthened. Richmond’s programs are all carried out in accordance with the dike maintenance guidelines established by the Ministry of Environment, Lands & Parks. Richmond has an extensive drainage system comprised of pump stations, flood boxes, irrigation structures, and storm sewers. There are 39 pump stations located throughout the island which house a total of 112 pumps. At high tide, these pump drainage water into the river. At low tide, drainage water discharges through the flood boxes into the river via gravity outflow gates. These stations are powered by electricity and have the capacity to pump up over 1.3 million US gallons per minute, if required. All of the stations are monitored remotely, 24 hours per day, to ensure the pumps are operating effectively. These pump stations are designed for a 1 in 10 year rainstorm. To help prevent isolated flooding, the City monitors weather forecasts and pumps down the level of drainage water in the canals prior to any anticipated rainstorms. This provides extra capacity to hold the surplus drainage water caused by the storm. Richmond has a regular program and dedicated drainage utility to provide funding to maintain and upgrade this coordinated system to exceed today's needs and meet future needs. Dikes and dike upgrades Richmond has an ongoing program with dedicated annual capital funding for stabilizing and raising the existing dikes. The City has also undertaken various dike improvement projects on its own or with federal and/or provincial infrastructure funding in recent years. Through developers, much of the Middle Arm dike is being raised well beyond provincial requirements and improved in conjunction with ongoing development. The system comprises 320 km of ditches and canals and 600 km of box culverts and storm sewers. In addition to removing excess water for drainage purposes, the City supports the local farming industry by pumping water back into our system. The city has installed irrigation structures, which allow water to be drawn in from the river for our local farming operations, i.e. cranberry and vegetable farms, etc. Residents can trust that the City is continuously planning and building upon its infrastructure for flood protection management that exceeds predicted needs to protect the City. 2008 to 2031 Richmond Flood Protection Strategy June 23, 2008 Council Meeting Minutes, Item 23. Dike Master Plan - Phase 1 Report April 22, 2013 Council Meeting Minutes, Item 19. Dike Master Plan – Phase 2 Report April 23, 2018 Council Meeting Minutes, Item 17.